This valentine is not for my husband of nearly forty years. It's not for our four adult children either. It's not for our 'Israeli daughter', the girl who became part of our family over twenty years ago. It's not even for our eight little grandchildren, who inspire the most boundless love imaginable. This valentine is for our four bonus kids- the three who married into our family, and the one who is engaged to our youngest child. In-law relationships are fodder for endless jokes and sometimes the source of much heartache. Not for a moment do I take for granted that our family hit the jackpot four times. Each bonus kid brings so much happiness to the child he or she married, but there's more. Each bonus kid brings out the best in that child. We were a few years into the married-kids stage of life when I realized the formative role our bonus kids played in who our children became. Adulthood is an age and a stage; it arrives in some form after enough years have passed. We "got them older" as my husband likes to say. But being a devoted spouse and parent isn't an age, it's an aspiration. We tried to model that for our kids, but a parents' example alone is not enough. Finding the right person to spend your life with is what inspired our kids to reach high, to emulate what they learned. I've told our daughters-in-law and son-in-law many times: we raised these kids but you completed them. They are who they are because they wanted to be worthy of people like you. As I've gotten to know these kids, I've grown to love them, and to appreciate the specialness they add to our family. One kid has the biggest heart for gift giving, choosing the most original presents which never fail to delight the recipient. That included crafting a custom-made memory book for my 60th birthday. The same kid is also an accomplished photographer. Another eats everything I cook with gusto and appreciation, making me feel like I'm the world's best cook. That kid has a smile that could melt a rock. Then there's the kid who is the model of patience and internal tranquility, bringing calm to any situation. This same kid is also the go-to for fun activities around town, most of which I'd never have found on my own. And then there is the kid who enchants all the grandchildren with imaginative play. The look in their eyes says it all. My bonus kids have taught me so much about how to grow a family; these relationships take effort on both sides. I had to learn how to step back, give space, curb my bossy impulse. But what our bonus kids had to do was harder. When they married into our family they already had wonderful parents, siblings, and extended families of their own. The essential roles were filled. Yet they made room in their hearts for more. They joined our family all the way. Two months ago I saw for myself the extent of their devotion. My brother, sister-in-law, and their family lost their home in a devastating fire. The morning after the fire, our house was command central. Our children and their spouses were on hand to help and comfort their shocked aunt, uncle, and cousins. Our kids in Chicago did the same, supporting their Chicago cousins grieving the loss of their childhood home. Whether 'born-in' or 'married-in', they functioned as one team. One family. What began with four kids grew to eight, and, oh, how grateful I am for them! Happy Valentines Day to the four kids who came to me as adults, and put deep roots in my heart. When even the most mundane errand becomes a sugar consumption opportunity, we are a country in trouble. Over the past few months I've become keenly aware of the candy bowls and treat baskets that dot the commerical landscape. My wake-up call began the day I took my car in for service. I poured myself a tall cup of coffee in the customer lounge. Then I noticed the donut holes and granola bars. "Why do we need sugary treats to make it through an oil change?" I wondered. An hour later my car was ready. When I went to pay, the cashier offered me a big, juicy apple to take along. Because, evidently, donut holes and granola bars are not enough. Customers might need an additional infusion of carbs just to make it from the cashier to the parking lot. Ever since that day I have been on the lookout for businesses peddling a sugar fix along with their merchandise or services. The dry cleaner is doing it. The financial planner is doing it. At a book fair last fall every single publisher and book seller had a dish of candy or treats at their table. 'Treats' used to be foods that were special because you ate them only now and then. Today? 'Treats' are now and now and now. On a day of errands you can knock off half a dozen treats before noon. In case you haven't noticed we are in the midst of an obesity epidemic. Over one-third of US adults are obese, not to mention those that are just overweight. Take a look around you. Once upon a time, the obese person was the exception. Now the lean person is. Look back at photos and films from the fifties and sixties to see how much things have changed. Peruse vintage clothing from that era. A size ten will seem tiny compared to our generously sized, relaxed fit fashion. Notice the amply-proportioned mannequins turning up in many stores. A sea change, and not a good one. Please don't say I am fat-shaming. I'm not. Fat is not shameful. Fat is dangerous and there are mountains of data to bear that out. Although I'm formerly a registered dietitian, you don't need a medical background to understand the scope of the problem. The data speaks for itself. Diabetes has skyrocketed along with obesity. In 1958, when obesity rates were far lower, less than 1% of Americans were diagnosed diabetic. By 2015, that number rose to 7.4% of the US population. The Center for Disease Control estimates that as many as 7 million more people are undiagnosed diabetics. Some 84 million are prediabetic, a condition that can lead to Type 2 diabetes if left untreated. The CDC projects that as many as 1 in 3 Americans could be diabetic by 2050. That means that in the span of 100 years the percentage of diabetics could go from less than 1% to as much as 33%. Most alarming of all is the rise in Type 2 diabetes among children and teens, coinciding with the increase in childhood obesity. Type 2 diabetes in kids was almost unheard of before 1980. Diabetes can lead to devastating health consequences, among them blindness, kidney failure, and leg and foot amputations. There's more. Evidence is mounting of a relationship between high sugar diets, high blood sugar, and dementia. One recently published, longitudinal study found a faster rate of cognitive decline among people with high blood sugar compared to those whose blood sugar was normal. The study even showed an association between pre-diabetes and cognitive decline. Perhaps the widespread prevalence of diabetes will lull us into seeing it as less harmful than it is. Maybe the prospect of dementia feels too many decades away to worry about. Well, there's always cancer, unique in it's ability to scare the daylights out of you. According to the National Cancer Institute there is consistent evidence that obesity is associated with an increased risk of a number of cancers. One of those is breast cancer. Which brings me to the tipping point that propelled me to write this essay. Recently I went to one of Minnesota's top facilities for an annual mammogram. Guess what greeted me in the waiting room? A big old dish of candy. Because even having a mammogram has become a sugar-dosing opportunity. What made this so infuriating is that I expect health care providers to lead by example, rather than blindly follow harmful social trends. Solving our obesity problem requires us to change behaviors that have become part of our cultural landscape. Human beings were not designed to consume donuts as big as your head or restaurant portions that could feed a family. And we are not built to consume sweets, treats, and candy every day, much less multiple times a day. But we are a nation hooked on sugar, and the opiod-like stimulation of the brain it produces. Where to begin? Well, how about getting rid of those candy dishes? Sound harsh? Then try this thought experiment. Imagine that the car repair shop, the dry cleaners, the cute boutique, and even the mammogram center have bowls of free cigarettes and matches on the counter. The idea is preposterous, but only because we now understand smoking's danger and take it seriously. It's time we regard the non-stop consumption of sugar as the danger that it is. Have you ever held onto something for years, something you didn't really need, and then one day, suddenly, this thing is exactly what you need? That's what happened to me yesterday. For 45 years I've held on to two hankies, embroidered with my initial, given to me when I was 'sweet sixteen'. 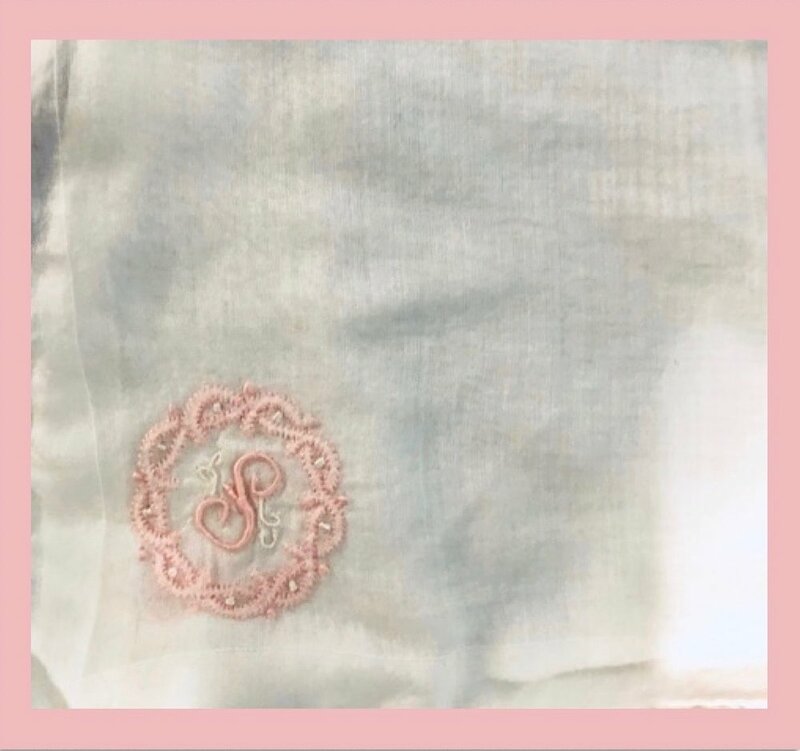 Embroidered hankies are a throwback to another era, to a time when long gone department stores like Daytons or Powers sold such things. And a time when people bought them. Probably an older relative or a friend of my mother's chose those hankies for me, thinking a lady always needs one in her purse. Well, this lady has always relied on travel packs of tissues. But I could never bring myself to toss the hankies. They stayed with me through college. They moved with me as a newlywed nearly 40 years ago. They've been tucked away in a closet or drawer ever since. I kept them not only because they are a tangible reminder of another time, but because they are a tangible reminder of the sixteen year old I was. Awkward, not cool, but eager to grow up and get going on life, with no clue as to how it would turn out. Only hopes. For 45 years those hankies sat unused. Until last night. Our local kids and grandchildren were here for Shabbat, as usual. One family was getting ready to leave today on a long-planned, long-awaited trip to Disney World. Over dinner we heard about what rides they'd go on and what characters the kids hoped to meet. Such excitement! Then it was time to for them to go home and pack. Our five year-old granddaughter grew clingy and teary. "Nanny, I'm going to miss you and Popsi so much!" she cried. "But it's just five days," I reminded her. "We'll see you next Shabbat and you'll tell me all about Disney!" Quivering lips and many hugs later, she headed for the car with her family. The tears and sobbing continued at home. "She is definitely in a Nanny phase!" my daughter said. I thought back to earlier in the week, when I gave my daughter a dress I no longer needed, but that would be perfect for her. Evidently traces of my cologne clung to the dress. As she plied her mom with hug after hug, she said happily, "I just can't stop hugging and smelling you!" This continued all the way to daycare, so powerful, so visceral is our sense of smell and its bond to memory. Suddenly, I knew exactly what I needed to do. I texted our daughter. "Would it be helpful if I dropped off a hanky with my cologne on it? Then she can tuck it under her pillow at night." "YES!" our daughter texted back, along with a video of our sobbing granddaughter, who said this would definitely make her feel better. I went upstairs and found the two hankies that had never wiped a nose or caught a sneeze. Hankies that had never mopped a brow or dabbed a tear. I spritzed them with cologne and delivered them to our daughter. They are now on their way to Disney. There's only one more thing I wish I could do. I wish I could go back and meet my sixteen year old self. "You were smart to save those hankies. There's magic ahead for you. You'll see." They say becoming a grandparent is transformative. That the explosion of love brings out a side you never knew was there. But I never dreamed that the love of grandchildren had the power to transform my husband into a gardener. What's the Opposite of a 'Selfie'? Great lives offer us a yardstick by which to measure our own. Barbara Bush's funeral service was a fresh reminder of that truth. The tributes to her were touching, soaring, funny, heartfelt. She built a cohesive family. She lived a consequential life. Those words captured my attention as beacons, as directional markers. Three not-so-commonly used words that we need now more than ever. Start with selfless. I wonder how many people know what this old-fashioned word means. Might they think that 'selfless' is a 'selfie' gone bad, where you missed your shot and ended up with a picture of the floor? 'Selfless'-- to be concerned more with the needs and wishes of others than with one's own--feels at odds with our culture of self-promotion and self-actualization. It's not that people have stopped practicing selflessness. Putting the needs of others before yourself is built into parenthood. Selflessness is part of volunteering your time. It underscores the tiny interactions of everyday life. But hearing that word used to eulogize Mrs. Bush reminded me of its importance, its corrective power against the selfie culture. It's a word that deserves respect, elevation. Barbara Bush built a cohesive family. Cohesive- I love that word! A cohesive family is unified. It sticks together. Cohesiveness doesn't rely on love. It reaches for something that transcends the ups and downs of feelings. A cohesive family is in it for the long haul. Its glue withstands bumps. Such a family allows breathing room. Its members give each other space for difference. Where love can fracture, cohesion can stretch. Unfortunately, in many families there are personalities, circumstances, and other factors that make cohesion impossible. Thus, the building of a cohesive family is all the more noteworthy. It's aspirational and inspirational, a stunning achievement. The first two words lead straight to the third word, consequential. A consequential life is a life of significance, a life that mattered, a life that made a difference. In a culture that exalts celebrity, it's easy to think that the sure path to a consequential life is to be famous. Although Mrs. Bush was indeed famous, it was not her fame that made her life consequential but what she chose to do with the years she was granted. Fame is available to a few; living a consequential life is available to all. This is what I learned from Barbara Bush, a selfless person who built a cohesive family and lived a consequential life. A trio of words that offer a concise philosophy on how to live. A century ago many families lived in big, multi-generational clusters. Some still do. In this arrangement everybody receives something essential. Parents get support for the nonstop demands of child-rearing. Kids bask in the love and attention of grandparents, their biggest fans. For grandparents the gifts are the most precious. When grandchildren are born, they fling the door open to a room in your heart you didn't know was there. It's a room you don't want to leave. If your grandchildren live nearby, you don't have to. We have two sets of grandchildren living minutes away. You could say that we have our own version of the multi-generational lifestyle. Our house is the hub for for a happy band of cousins that get together several times each week. Little kids who love to play together, eat dinner together, have slumber parties together. They snuggle on the couch to watch TV, then play hide and seek to stall for more time. Finally, they line up together for a Hershey kiss before they go home (two kisses on Shabbat). Last week, our Chicago kids and three grandsons arrived at our house for a nine-day visit. That was the start of a non-stop party because having the Chicago cousins here is so, so special. The kids wanted to play together EVERY DAY and they did! A total of four boys, four girls, all four years old and under. Three are infants; two of those infants are newborns. Every night was playtime for the five children old enough to play. Dinner was in shifts, with the kids eating first at their little green table. Then they piled onto the couch to watch TV while the grownups ate and eagerly chatted. The babies were passed from one set of arms to the next. Over the days, lines blurred. This aunt cuddling that nephew. This uncle throwing that niece in the air. Every lap was open seating. Saying goodnight took a long, sweet time, as each child made the rounds, hugging cousins, aunts and uncles. Every night at bedtime, our grandsons asked the same question: Will the cousins come back to play again tomorrow? Yes, I promised. They will. I know that this is not the lifestyle for everyone my age. Cooking for a crowd night after night, running the dishwasher three times a day, a return of toys and baby gear---no thanks, some say. We raised our kids. This is too much. This is over the top. But I still prefer chaos. I love over-the-top. I'll take that every time. And there's this. On Saturday afternoon we settled our three visiting grandsons down to nap. Then our local son asked if he could drop off his newborn while he ran errands. Sure, I said, why not? Within an hour that baby was fed and napping too. Mike and I gave each other a fist bump, then relaxed with coffee and the newspaper. Getting a four-year old, a two-year old, and two infants to nap at the same is how you feel like a rock star at sixty! Saturday night was the grande finale of our week-long party and we all made the most of it. Goodbyes stretched out for a long time. The Chicago crew hit the road early the next morning. Our four-year old grandson climbed into his car seat, head bowed and tears flowing. His parents said he was still waving goodbye long after our house disappeared from sight. He wasn't the only one shedding tears. The house is back to being clean and quiet, but I hope not for long. We still have five grandkids here. It's time for them to come back and mess everything up! "Just stay right here, 'cause these are the good old days," sang Carly Simon a generation ago. Yes, yes, these are the best days of all. Upon turning eighty, writer Joseph Epstein took inventory of his suits, shoes, and overcoats. His assessment? No need to buy more. "These should see me out", he said. Epstein's poignant, witty essay moved both Mike and me. Eighty is still two decades away, but the idea that there's a point where certain purchases no longer make sense stuck with us. We kidded about it in a light hearted way. For some reason we had accumulated box upon box of Q-tips, a Costco shopping brain glitch. The last time I opened the cupboard and saw those untold numbers of little white reminders of absent-minded shopping, I said to Mike: "No need to buy more Q-tips. These will see us out." We laughed about the Q-tips and laughed about the idea. Then we went shopping for a new dining set for our patio. When it comes to patio furniture, we've always gone low-budget. It's Minnesota, after all. The summer is short, the winter harsh. Outdoor furniture takes a beating no matter what. So we always bought cheap, and when the wood rotted or the metal rusted, out it went. Something happened this time on the way to buy a cheap table and chairs. We discovered a new kind of patio furniture made of nearly indestructible composite material. "It's guaranteed for twenty years!" crowed the young salesman, not much beyond twenty himself. Furniture guaranteed to last until we are eighty? He had my attention. I walked slowly around the large rectangular table, with comfortable chairs at each end and benches along the sides. Benches that allow you to squeeze in one more. I imagined our sturdy-backed little grandchildren lined up on those benches. A dining set built for overflowing capacity. It was perfect. I wanted it at once. Mike took a different, very sensible view. He looked at the price, which was at least four times what we have ever paid for such furniture. Then he did the math. He figured out the cost per use, based how many times per year we would likely use the set over the next twenty years. His estimate? About $10 a time, in a best-case scenario. I am a sucker for best-case scenarios. And I thought that $10 per use sounded just fine. On the ride home, we both had the same thought. "This will see us out" we agreed. And although we were smiling, it was not the same as talking about Q-tips. Furniture can come with a twenty year guarantee but there's no such guarantee for people. Not for twenty years, not for ten years, not even for a day. What happens if Mike outlives me by many years? Will he still troop out to the patio for dinner with the family? I picture myself in some heavenly realm calling out to them, "Hey you guys! It's a gorgeous day! Go eat dinner outside!" But there they are, sitting in the air-conditioned kitchen, and no one can hear me. Back to the here and now. The dining set awaits, ready to hold our family, our friends, our food, our laughter, and our memories for the next two decades. And now, in addition to all the usual reasons that we pray for health and long life, Mike and I have a new one. We want to outlast the damn patio furniture! Fifteen years after my father died suddenly, had he finally come to say goodbye? The way this long-forgotten note appeared seemed like more than mere coincidence. On a bitterly cold January day, when I was 18, my dad had a heart attack. He was found lying on the ground, alongside the truck he drove for a living. By the time help arrived it was too late. He was 53. There was no warning. My father simply vanished from this world. When the day began, when I left for school in the morning, he was here, in all his green-eyed, robust aliveness. When the day ended, he was gone. There would be no tender exchange of love and thanks, no last embrace. Fast forward 15 years, and that 18-year old girl was now a 33-year-old married mother of four. With summer road trip season in full swing, what parent doesn’t need a good idea for keeping the peace in the car? We took many lengthy road trips with our four closely spaced children and this little gem was a lifesaver. I wish that I could take credit for the simple genius behind this idea, but credit goes to parenting expert John Rosemond, whose books I devoured during our child-rearing years. His approach is strict, clear, and puts the adults in charge. In other words, it is totally counter-cultural and it really works. I’m eager to share the goodies with a new generation of parents. So, here is how a stack of poker chips enabled our kids to control their behavior over long hours in the car. At the start of each road trip, before we pulled out of the driveway, we showed the kids an index card on which were written three simple rules for behavior in the car. We gave each child three poker chips. In a few sentences I laid out the plan. And with that, we hit the road. To no one’s surprise, each child managed to lose a chip before we reached the highway. The kids usually forfeited their second chips moments later, and then….peace reigned for the next many hours. Every now and then I would catch them checking their pockets to make sure the remaining precious chip was still there. That chip was their ticket to swimming at the hotel pool, a walk to the nearest ice cream shop, or whatever recreation was available wherever we happened to be. The next morning, everyone got their three chips back when we hit the road again. The system worked like a charm because it was simple and we enforced it without discussion, threats, or debate. You break a rule, you lose a chip. The kids knew we meant business. In all of our many road trips, I think that there was only one time that a child had to stay behind with a parent because he or she blew through all of their chips. The beauty of having such a clear system was that it actually freed all of us up to enjoy our time together because the kids’ behavior was under control. We were all spared the misery of tiresome haranguing, threats, and arguing. Our kids are grown and are now young parents themselves. Today there are many delightful high-tech gadgets that will keep kids occupied for hours in the car. But being occupied is not the same thing as learning self-discipline. The simple poker chip teaches kids an essential life lesson.